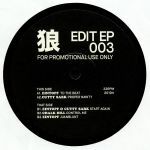 Review: Edit EP delves back into the vaults to uncover a glorious set of '70s and '80s disco gems. The third instalment from the well known Brighton based record label sees the return of Eintopf alongside resident producers and label mates, breathing new life into unknown rarities. Retouched, reloved and reworked to offer a fresh spin on the originals, highlights are undoubtedly on the A side, with Cutty Sark's rework of a certain neon-lit boogie down number ("Proper Nawty"), the romantic and soulful number "Start Again" with Eintopf and Chalk Hill's respectful edit of a right classic ("Control Me") on the flip.